It seems aliens, in the eyes of UFO hunters at least, aren’t content with just building on Mars. 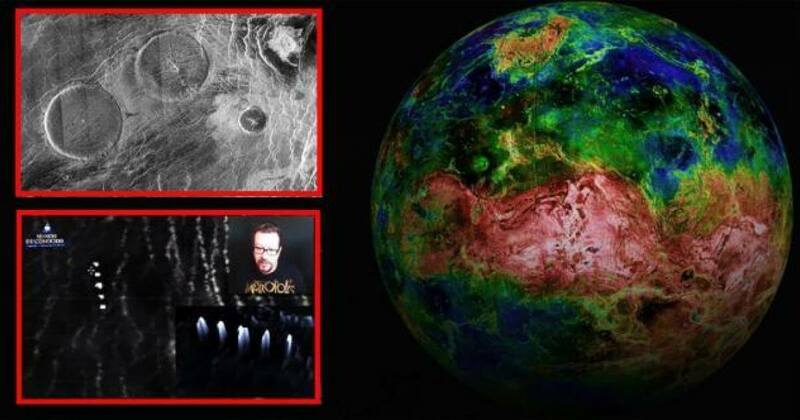 Recently published images of Venus appear to show ‘huge cities, artificial structures and all kinds of elements’, according to one researcher. He says the buildings were created by some kind of alien race. YouTube and alien hunter mundodesconocido put a video together explaining the large cities he claims he found while analyzing the collection of photos. He even created 3D models of the structures. ‘Artificial bizarre shapes appear to be cities and seem to have elements that emit light,’ he said in the video. Mundodesconocido takes viewers on a tour through the ‘great city’ on Venus, showing raised structures all over the planet that could be alien apartment complexes or just craters on the surface. These images came from the Magellan probe that was shipped off to Venus in 1989, which arrived a little over a year later to collect data. Its mission was study landforms and tectonics, impact processes, erosion, deposition, chemical processes and the planets interior. At least 85 percent of the surface was found to be covered with volcanic flows, which could explain the protruding structures referred to as ‘huge cities’ in YouTube clip. Scott C. Waring of UFO Sightings Daily, published the YouTube video on his blog to share with these findings his followers. Venus is the second planet from the sun, orbiting at a distance of about 67 million miles (108 million km). One Venus year lasts longer than a day on Venus. A year lasts 225 Earth days and the planet spins so slowly that its day lasts as 243 Earth days. It is a dim, but hot and volcanically active planet and it spins in the opposite direction of most planets. It is a sad reality that some spacecraft like Nasa’s Philae lander don’t last as long as they should, while others such as Esa’s Venus Express continue to surprise us. As part of its recent swansong, as the probe plummeted toward the planet, the Express gathered new and unexpected information about the planet’s polar atmosphere. It spent eight years orbiting the planet, greatly exceeding the mission’s planned duration of 500 days, before it ran out of fuel. The probe then began its descent into Venus’ atmosphere, before the mission lost contact with Earth in November 2014 and officially ended the following month. Before it plummeted down through the planet’s atmosphere, the probe’s measurements showed it to be rippling with atmospheric waves and, at an average temperature of -157°C (114K), is colder than anywhere on Earth. These recent observations show the planet’s atmosphere is much more interesting than first thought. Our previous understanding of Venus’ polar atmosphere was based on observations gathered by Nasa’s Pioneer Venus probe in the late 1970s. These were of other parts of Venus’ atmosphere, near the equator, but extrapolated to the poles to form a complete atmospheric reference model.